From my view as a rescued doggie : If you already have a dog and want to consider fostering a dog until he/she finds a permanent home, THANK YOU! I would like to share something that I have learned throughout my 10years on this planet. HOWEVER..pay close attention now....all makas to the front of the class....there are many things to consider before agreeing to foster a puppy or a dog from any group or private party. Fostering is a wonderful experience and I'm not joking when I say that it saves lives. It really does!! It saved mine! So I get why some people see a little hurt puppy or an old doggie that is all buss up in the face from abuse...the kindhearted human wants to help that doggie. And that's really GRReat! HOWEVER...(here's that pause again)...if you do not have the time to foster, please consider in helping that dog in other ways. You could offer transportation, you could share the need for help on your social media pages, you could donate a doggie bed. The list goes on. Ok, back to the point. Fostering. If not taken seriously, it may become overwhelming for not only the humans but also for the rescue doggie. Think about it. The dog is the one who ultimately gets freaked out (or worse, injured!) if he/she lands in hands that are not capable. And by not capable, I mean someone that cannot devote the hours during the day that the puppy or dog will need to learn new things. Dogs that need fostering often come from rough backgrounds. I mean, look at mine...(see my bio below), I was sold at a chicken fight as a puppy. I was afraid of the world yet curious about it. I would run in the street if my foster wasn't on top of things like teaching me how to walk on a leash and never letting me off-leash. Let's face it pals. My name is Josie. I am a dog. Even though I know I have it cherry at my home, I am a dog. I have instincts. And even though I am a good girl and I listen, if there is something that tingles my instincts to override my brain, that is when I depend on my human to know me more than I know myself. That takes time. So pals, if you don't have the kind of time it takes to potty-train, leash train and so forth, please allow a foster to step up that would be able to provide that dog's care. There are many dogs in need. One will come along that may not require much time. The dog may be potty trained already. Who knows. Like I said, there are LOTS of doggies in need. It should ever be a compulsive decision and someone should never have to convince their partner to allow them to foster. Everyone has to agree or it won't work out and the dog will feel it. At times, it often leads to dogs being lost by a well-intending individual who only thought that fostering was giving a bath to a dog and buying a cute little doggie bed. Some dogs are never recovered. Sorry to be grim, pals. But this is why I educate. To help people learn through my eyes and experience of what I have been through and the many things I have learned. In the later part of 2008, there were a few new puppies on the beach. When we asked how they came to be, we were told about a guy selling the puppies to the homeless people. We were floored to hear that someone would bring puppies to the beach to sell them. He was asking for $40 a pup. One pup, Marley, was sold for $5! A couple days later, we got a call from one of the camp ohana. They told us that another of the siblings was just dumped off! No one wanted to take care of it and they asked if we could come and pick the puppy up. We went down there and saw Marley's sister...Josie (she had no name at the time). The camp ohana told us that the guy who dumped her actually sold Josie at a chicken fight. The person who bought her changed their mind and gave her back to the guy. Then, he went and dumped her off on the same homeless beach that her siblings were sold at. Looking at her now, even back then--no one would ever realize what she had been through or to even fathom that she was sold at an alleged chicken fight! We are glad that she no longer has to worry about anything like that any more! Rescued dogs ROCK! She often is seen tagging along on vet appointments or visiting the staff at one of our vet offices. 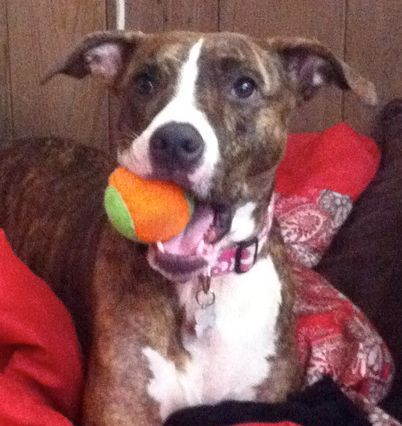 Josie is a healthy young dog who gives the goofiest smile and simply enjoys life! 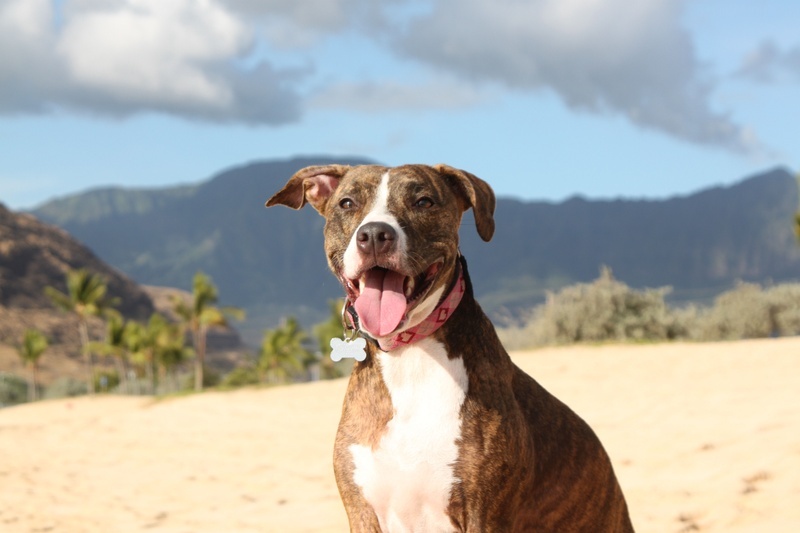 She is our Ms.Aloha Spokes-Dog. Her mission is to help other doggies with some tips and things that she has learned in her life. 100% of your donation goes directly to helping a dog in need!